Kansas football head coach Les Miles directs his players on the field just before running a play. LAWRENCE, Kan. — The Les Miles era has begun on the field for Kansas football. 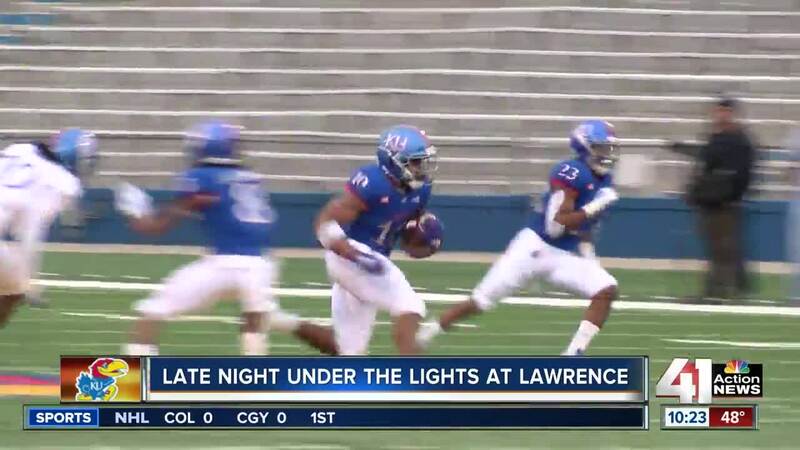 The blue team defeated the white team 45-7 in KU's Late Night Under the Lights out at Memorial Stadium. The spring football game was the culmination of 15 team practices. And, the team performance wasn't the greatest effort put forth by a Kansas football team, there is still plenty of time until their season opener Aug. 31 against Indiana State. The rushing attack was stellar, gaining a total of 454 yards on the ground. Senior running back Khalil Herbert led the way with 13 rushes for 154 yards and a touchdown. Les played six different quarterbacks. However, none of the quarterbacks that played threw for over 100 yards on the day. Junior quarterback Thomas MacVittie led all passers with 95 total yards. Neither Miles nor his players spoke to the media following the game due to a postgame concert by hip-hop artist Rick Ross. However, former KU players were in attendance to watch the action on the field. "(Les) knows what to do," Denver Broncos cornerback Chris Harris said. "He knows the in's and out's of the college football game. He's won at the highest level. And, to be able to have a guy to lead this program like that, him and Jeff Long, I mean, a great partnership. So, I'm excited." Other former players like former Kansas quarterback Todd Reesing approved of Les Miles. "I didn't have a chance to talk (to Les) for too long. But, I think his resume and his pedigree speak for itself," Reesing said. "What he accomplished at LSU and before that Oklahoma State. He obviously knows how to recruit. He knows how to coach. He knows how to build a program."